First, a thanks to you all for the birthday wishes passed along yesterday! I had a great birthday. Caleb surprised with me a gorgeous bouquet of flowers; I received cards, calls, texts, presents, and love all throughout the day; and Caleb and I had a wonderful evening together. I love how special I always feel on my birthday! Cook pasta according to package directions, just 1 minute shy of al dente. Meanwhile, dice 4 tablespoons of the butter and place in a large mixing bowl. Warm the cream in either a saucepan or in the microwave. Cover to keep warm. Once the pasta is cooked, add to the bowl with the butter and toss to coat well. Stir in the warm cream and Fontina until the cheese starts to melt. Add salt to taste. Pour into a buttered 2-quart casserole dish. In a small bowl, melt the remaining 1 Tbsp of butter. Add the panko and Parmesan. Toss with a fork to coat evenly with butter. Sprinkle the mixture evenly over the pasta in the dish. Bake at 400 degrees until sauce is bubbling and top is turning golden brown, about 15-20 minutes. Serve immediately. Once the pasta is cooked, add to the bowl with the butter and toss to coat well. Stir in the warm cream and Muenster until the cheese starts to melt. Add salt and pepper to taste. Pour into a buttered 2-quart casserole dish. In a small bowl, melt the remaining 1 Tbsp of butter. Mix in the cracker crumbs. Toss with a fork to coat evenly with butter. Sprinkle the mixture evenly over the pasta in the dish. Bake at 400 degrees until sauce is bubbling and top is turning golden brown, about 15-20 minutes. Serve immediately. I love mac & cheese! There is nothing better than homemade mac & cheese. Glad you had an awesome birthday! while i don't love mac and cheese (you know, my cheese aversion), i do love greasy food, particulary on a day like today where i guess you could say i'm "tired" ;) have a wonderful weekend! I love Mac & Cheese and your sound fabulous!! When I make it for my family I do 3 different versions because we all like it different ways!! I am going to have to do a post about it someday. So glad you had a good birthday Sherri! And Thank you for sharing this recipe! I am making my menu list and needed some ideas! hmmmmmm, mac and cheese. so glad you had a great birthday. Thanks for this fab recipe. i plan on making some mac and cheese at my son's 1st birthday in the next couple of weeks! My 18 month old loves homemade mac & cheese, which is great because there aren't many things he will eat (and I might love it too :)! Thanks so the recipes can't wait to test them out! Happy (belated) birthday to you! I haven't discovered my "signature" mac & cheese dish yet, thanks for sharing these I'll have to try! It's one of my favorite dishes to make in the fall and winter. ooooo i love any type of mac and cheese, especially the type with crunchy bread crumbs :) I'm so glad you had a good birthday!! Yay!!! 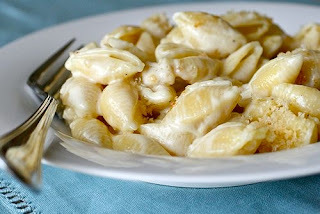 Sounds like you've had a great birthday week :-) Now you need to upgrade your "week" to a month, but don't tell your hubs that I suggested that ;-) These mac and cheese recipes have my stomach growling; they sound scrumptious! ack!! must have this tonight!! so yum. I could seriously live off of mac and cheese. That mac and cheese looks amazing, definitely bookmarking this! Happy belated birthday! I have to agree with you on the mac and cheese, defintaly one of my favorite comfort foods. My hubby can make a mean bowl of baked mac and cheese with japanese bread crumbs (my mouth is watering just thinking about it!) Both your recipes look delish and that pic came out gorgeous. Whoa that looks good! Have a great Sunday! I have not had mac and cheese in I don`t even know how long. This recipe is fabulous though and I definitely think i`ll be making it once the weather cools down some. Mmmm LOVE mac & cheese! Happy belated birthday! Muenster mac and cheese?? Why didn't I think of this. Oh man, it's on my recipe list for next week! Mac & cheese is definitely one of my favorite meals (I might still be 6 years old) :-) Hope you had a wonderful birthday!! I really appreciate of your self for the helpful information you have shared. I find this information very useful and it has considerably saved my time. Thanks dude.